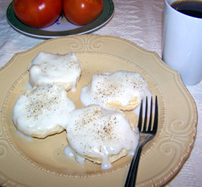 Nothing screams southern like biscuits and gravy. If you add a sliced fresh tomato, hot coffee, scrambled eggs and bacon, you’ve got yourself a down-home breakfast! In a skillet (I use a cast iron skillet) melt shortening. Sprinkle in flour salt and pepper and stir with a wire whisk to prevent lumps. Cook over medium high heat until slightly browned. Pour in milk and reduce heat to medium. Stir constantly until gravy has thickened. Pour into a bowl and serve immediately. Keep in mind that gravy will thicken slightly as it sits.